Priesthood on February 20, 1529, Saturday of the Four Ember Days of Spring. It is animportant and spectacular ordination with 99 candidates: 21 for the priesthood, 26 for the deaconate, 18 for the subdeaconate, 21 for the Minor Orders, and 15 for the tonsure. Zaccaria is the third in the list of those to be ordained as priests. For all three ordinations the bishop was Luca di Seriate (Bergamo), who was suffragan of the bishop of Cremona and Ravenna, Cardinal Benedetto Accolti (who was always absent), titular also of Duvno Erzegovina), suffragan diocese of Spoleto. 1) Subdiaconate on September 19, 1928, Saturday of the Four Ember Days of Advent. There were 30 candidates for various orders: nine for the subdeaconate; six for the deaconate; eight for the priesthood; three for the tonsure; four for the Minor Orders. Zaccaria is the second in the list of the subdeacons. 2) Diaconate on December 19, 1528, Saturday of the Four Ember Days of Winter. 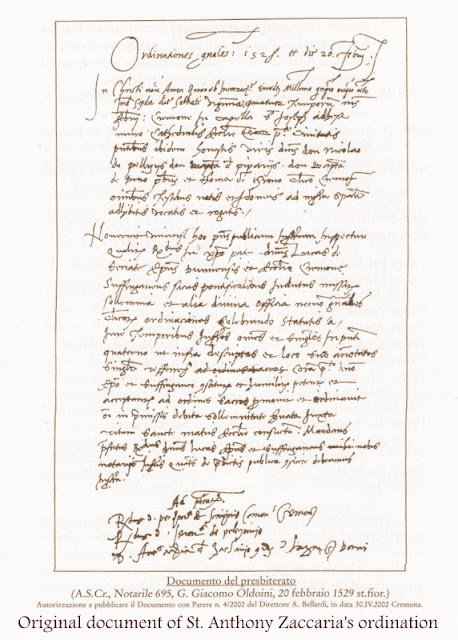 The Notary Oldoini announces the ordinations as done for the others, but then he leaves blank the following three pages either because he did not receive the names, or because he was going to do it later, or maybe the list of deacons got lost. For all three ordinations the bishop was Luca di Seriate (Bergamo), who was suffragan of the bishop of Cremona and Ravenna, Cardinal Benedetto Accolti (who was always absent), titular also of Duvno (Erzegovina), suffragan diocese of Spoleto. All three ordinations took place in the Chapel of St. Joseph, along the left wall of the Cremona Cathedral central nave. It is here that Anthony Mary received all the Major Orders and most likely also the tonsure and Minor Orders (June 6, 1528). 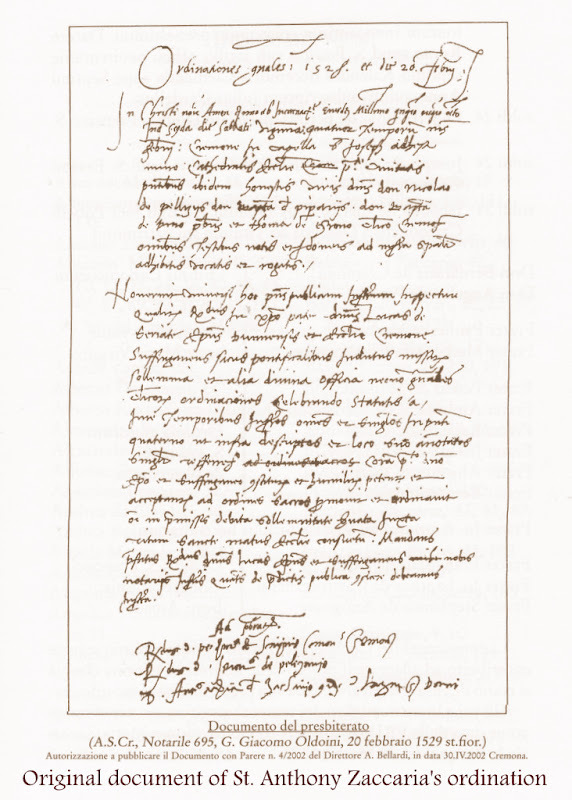 *Note: A.S.Cr., Notary 695, G.Giacomo Oldoini, 20 February 1529 sr.fior in "Antonio Maria Zaccaria 1502-1539: Una meteora del cinquecento nella scia di San Paolo Apostolo," Franco Maria Ghilardotti, 2009, p. 201. In Christi nomine. Amen. Anno ab Incarnatione Eiusdem Millesimo quingentesimo vigesimo octavo Inditione secunda die Sabbati vigesima quatuor Temporum mensis februarij: Cremone.in Capella S.Joseph adhesa muro Cathedralis Ecclesie Cremone predicte Civitatis presentibus ibidem honesties viris dominis don Nicolao de pellizijs, don Baptista de piperarijs, don Baptista de paterno presbiteris, et Thoma de Groro clerico Cremonensi, omnibus Testibus notis et Idoneis ad infrascripta specialiter adhibitis, vocatis et rogatis. Noverint universi hoc presens publicum Instrumenrum Inspecturi Qualiter Reverendusin Christo pater dominus Lucas de Seriate Episcopus Dunnensis at Ecclesie Cremone Suffraganeus sacris pontificalibus indutus missarum sollemnia et alia divina officia necnon generals clericorum ordinaciones celebrando statutis a Jure Temporibus Infrascriptos omnes et singulos in presenti quaterno ut infra descriptos et loco suo annotatos singulariter refferendo ad ordines sacros Coram predicto domino Episcopo et Suffraganeo constitutos et humiliter petentes et acceptantes ad ordines sacros promovit et ordinavit omni in premissis debita sollemnitate servata Juxta ritum Sancte matris Ecclesie consuetum. Mandans prefatus Reverendus dominus Lucas Episcopus et Suffraganeus mihi nobis notarijs Infrascriptis quatenus de predictis publicac conficere debeamus Insrrumenta.